Looking for food ideas? I like food. Actually I love food but I’m particular when it comes to it being nutritious, healthy and YUMMY. I started a food blog partly to keep track of my favourite recipes, and partly because friends and family were interested in my food discoveries. 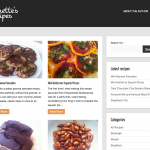 So in April 2015 “Annette’s Recipes, Alternative Yummy Food” was born.